While drinking dandelion root infusion as a coffee substitute may sound unsatisfying, the beverage does possess health benefits. Add dandelion root tincture or powdered extract to hot water, or infuse pieces of dried root in boiled water. Look for dandelion root products at health food stores, or harvest your own roots wherever you see dandelion leaves or flowers growing in pesticide-free places. Always check with your doctor before using any herbal self treatment, especially for conditions which may call for more aggressive medical attention. While two to four cups of coffee or tea a day aren't bad for most people, more than that can cause health problems. Potential side effects include irritability and anxiety, sleeplessness, increased heart rate and muscle tremors. In addition, some people are sensitive to even a little caffeine, or need to avoid it because of blood pressure, heart issues or medication. In such cases, replacing some or all of these caffeinated beverages with dandelion root tea represents a distinct health benefit. 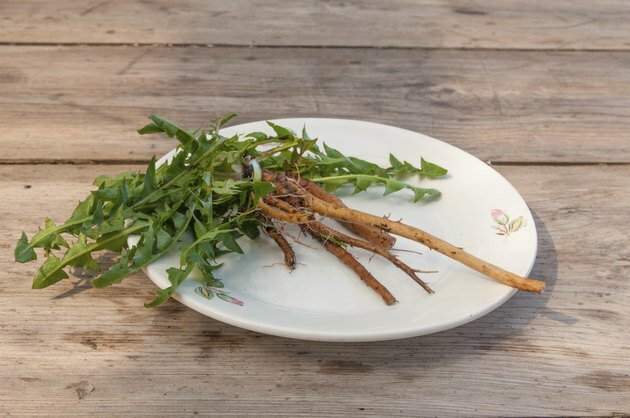 Some practitioners prefer dandelion leaf as a diuretic, while herbalists such as Kathi Keville, author of "Herbs for Health and Healing," recommend the root. Diuretics, which increase urine production, may be useful for treating premenstrual bloating and conditions such as mild edema. Other conditions which the University of Maryland Medical Center says dandelion may help through its toxin-flushing properties include high blood pressure and liver problems. Keville suggests dandelion root tea for pregnancy-related issues such as swollen limbs and sore breasts due to fluid retention. The tea's diuretic benefits may also help fight the dangerously high blood pressure related to eclampsia during pregnancy, but obviously your doctor should be consulted immediately for this condition. Dandelion root may promote digestion and reduce stomach pain through its gentle laxative effect, notes UMMC. It also helps promote healthy gastrointestinal bacteria. The center recommends drinking up to three cups of dandelion root tea each day by boiling 1/2 to 2 teaspoons in about 1 cup of water for several minutes. Strain and cool slightly. Because of its ability to flush toxins from the system, dandelion root may work well for people prone to gall stones, according to Drugs.com. It seems to promote healthy bile secretion, and may also dissolve the gallstones themselves. While animal research looks promising, more clinical research is needed to determine the effectiveness and recommended dosing for gall bladder issues, notes Drugs.com. The dandelion comes packed with several crucial vitamins and minerals, according to the University of Maryland Medical Center. Among the nutrients found in the plant are B complex vitamins, vitamins A, C and D, zinc, potassium and iron. UMMC notes that while other diuretic products can have the unwanted side effect of flushing potassium from the body, dandelion root tea actually adds it. The pesticides used in growing important tea and coffee bean crops are sometimes treated with chemicals to reduce weeds, plant disease and insect problems. Princeton University notes that between 30 to 90 percent of commonly used farming chemicals may carry health risks. While organic coffee beans certainly exist, it's easier, and certainly cheaper, to ensure that your own harvested dandelion roots are organic. Make sure to harvest them from pesticide-free lawns or meadows. If you buy prepared dandelion root coffee substitute at a health food store, look for "organic" on the label.